A bride at fifteen, widowed at the tender age of twenty, Barbara, Countess Devane, embarks for colonial Virginia financially ruined by the death of her husband in scandalous circumstances. Dressed in mourning as is proper for a woman, she is patronizingly described as a "fragile black butterfly," but the fragility is deceiving. She makes a place for herself in the new world, takes lovers and friends across political divides, and questions the established traditions of slavery. Facing enemies she never suspected, she must return to England and deal face to face with the problems created by her husband, who haunts her even in death. Back in London, she quickly finds herself pulled into Jacobite plotting, and the treachery of powerful men suddenly threatens her family, her friends — and a new love. 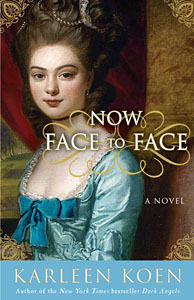 Now Face to Face sweeps readers from eighteenth-century America to London and brings both worlds to vivid life. It is a magnificent evocation of an era, from the plantations of Virginia to Hanoverian England. "Brilliant evocation of a turbulent...period" — Alison Weir; Book of Month Club main selection. This was my attempt to broaden themes. This will probably be the only novel in which there is American history; there is a primitive, masculine energy to much of it that makes me as tired as I used to be in fifth grade when the boys just pushed too hard.